Two updates in one day; imagine that. Unfortunately, this one doesn’t have the happy ending of the previous one. Try as I might, it’s starting to look like there won’t be any new GPFs in October. I’ve actually made progress with the strip, getting a number of weeks scripted (including the fates of “Nega” Nick and “Nega” Ki and we actually get to see the Gamester (gasp) doing something other than standing around and grimacing), a full week drawn (using the old seven-days-a-week reckoning), and half a week completely finished and ready to upload. However, all that work took over two weeks to complete, including the Labor Day holiday weekend. That’s nowhere near a sustainable schedule, and as I stated in the last GPF News post, I won’t start updating again until I can either build a buffer and sustain it or finish To Thine Own Self…, whichever comes first. Thus, my target end date for the current hiatus will be moved from October 2nd to November 6th (the first Monday in November). As promised, there will be a News update on October 2nd stating as much, but I thought I’d give those of you who visit her occasionally the initial heads-up. It’s been good working on the strip again, but with wild events like Ben’s surgery interrupting things, it’s getting really hard to come up with any sort of predictability. Like the pic? We had this made a little over a week ago and a certain department store with its own (cheap) photography studio. Ben wasn’t exactly cooperative that day; he was nice and quiet all day long, throughout the entire drive to the mall, and up until the moment we took him out of the car seat to change his clothes for the picture. Instantaneously, he went from the sweetest, quietest baby you’ve ever seen to… well, this. We managed to calm him down somewhat and get a few decent pictures out of the session, but this one oddly enough seems to be our favorite. Instead of him looking like he’s in some sort of drugged, unhappy stupor like the others (not to worry, no drugs were actually involved), this one has such emotion and energy that it just seemed to fit perfectly, even if he was being a little squalling monster. And, of course, the instant he went back into his car seat he returned to his normal quiet self. Isn’t that about par for the course? Well, that’s not really what this entry is about, but it’s a good segue into it because there was a very good reason the little guy was so unhappy. It turns out our little man had pyloric stenosis. For those too busy (or lazy) to click the link, that’s a small congenital narrowing of the valve at the bottom of the stomach which causes nothing to pass down into the intestines. As you might guess, if the stomach contents can’t follow the flow of gravity, they’ve got to come out somehow. Needless to say, we spent a good bit of the last week changing bibs, burp cloths, baby clothes, and occasionally our clothes several times in one day (and on the worst of occasions within the same hour). You can imagine how many The Exorcist references were thrown around this past week…. It’s very scary when your month-old child is mentioned in the same sentence as the word “surgery.” Even though we’ve come to find out that a pyloromyotomy is considered to be a routine procedure, that’s still not something new parents want to hear. That morbid thought enters your mind as you hand your child over to the anesthesiologist that this could very well be the last time you get to hold your son, no matter how reassuring the medical staff tries to be. Looking down at his little nose where the tube runs out where they emptied his stomach, seeing his tiny arm taped down like a useless club so he won’t accidentally pull out his IV… not images I’ll want to remember, but I know I will for the rest of my life. However, I’m happy to report that Ben is doing incredibly well now. He’s home and back to his normal self. He’s eating like nobody’s business, already surpassing his pre-stenosis intake. He even slept most of the way through the night last night, which made both Mommy and Daddy a lot, lot happier. All of this means, however, that this was yet another weekend where no comics were drawn, no boxes were unpacked, no drivers licenses or vehicle registrations were transferred, etc. I imagine we won’t get completely settled into our new house until Ben moves out to go to college or we find out we have to move again for whatever reason, whichever comes first. If it’s the latter, at least, half of the packing should already be done…. This blog is licensed under a Creative Commons License. 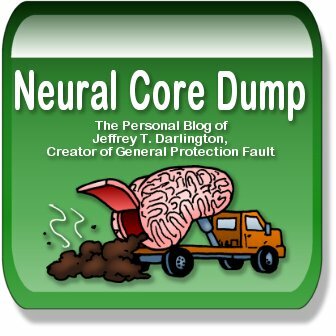 Neural Core Dump is powered by WordPress. Theme designed by Upstart Blogger, modded by Jeff.